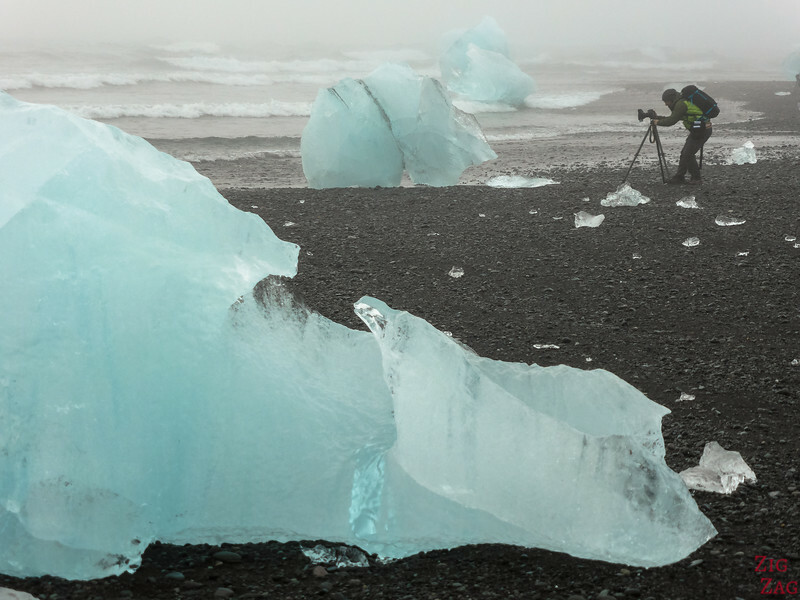 Diamond Beach Iceland (real name Jokulsarlon beach) is one of the most magnificent and fun spots for tourists and photographers alike in the country. 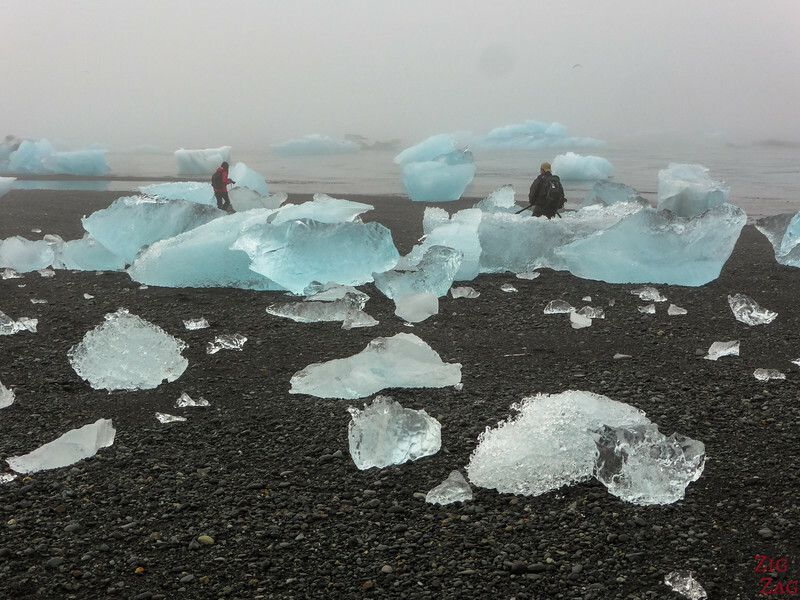 This is where you can observe sparkling icebergs escaping the lagoon and washing up on the back sand beach. 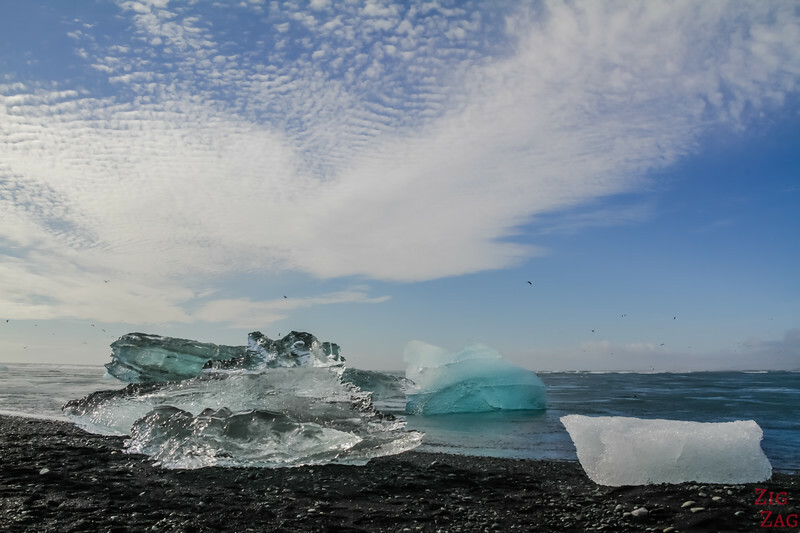 This is a surreal place where you are surrounded by small and huge blocks of ice of many shapes and colors over black sand. Below are photos and tips to plan your visit. 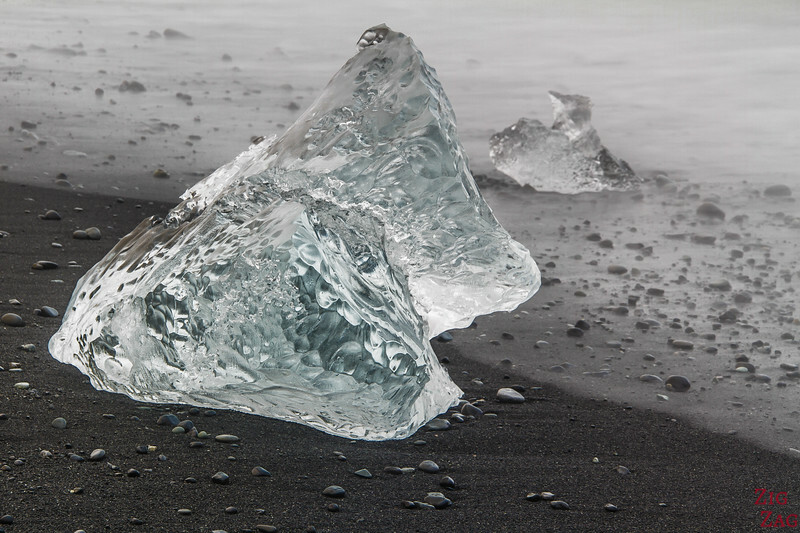 It is the black sand beach with the impossible name, you know, the "Iceland Black Beach with Ice"
When the Breidamerkurjokull glacier releases icebergs they float on the lagoon and some make their way through the channel. Then some of them can be pushed back towards the coast and end up on the black sand. 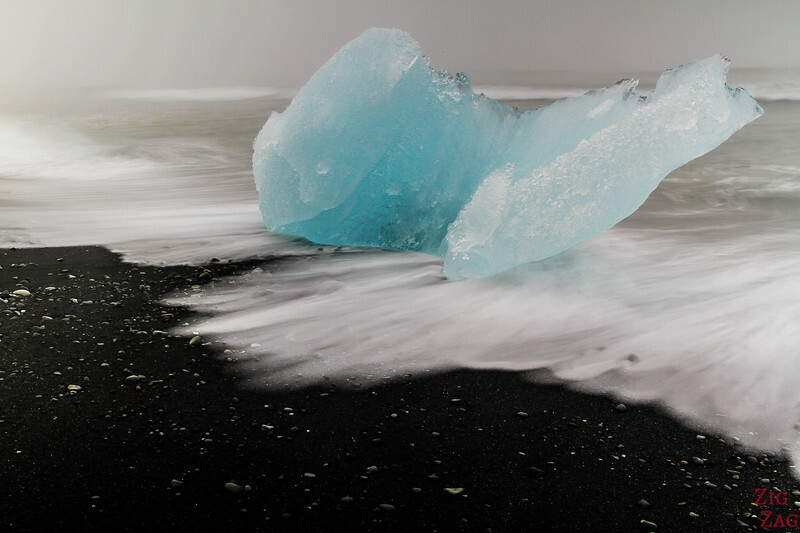 The ice, opaque white, black or deep blue contrasts with the white waves and the black sand making this location very unique. The black sand beach is formed from a volcanic rock. Sand and pebbles are tiny fragments from the basalt lava that covered the area. 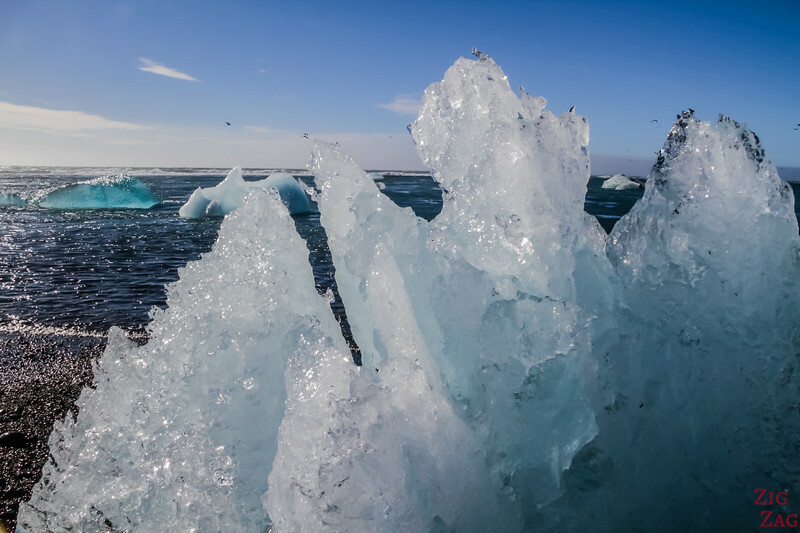 Jokulsarlon is known for its large glacial lagoon with icebergs floating around. Most people stop at the lagoon on their Iceland Road trip. 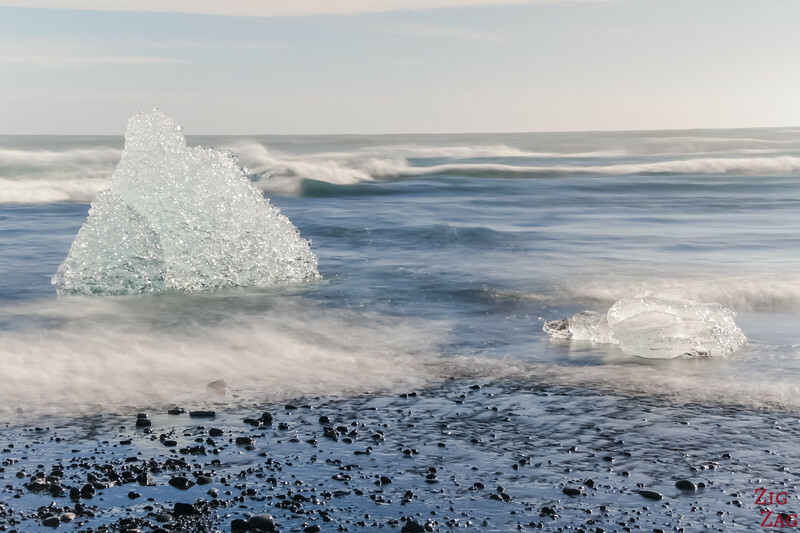 But many do not venture on the other side of Road 1 towards the sea, where some of those icebergs are pushed back on the black sand beach by the waves. As you are reading this, DO NOT MISS IT WHATEVER THE WEATHER! It is definitely on of the Best stop on the Icelandic Ring Road. Located between Vik and Hofn (but closer to Hofn). You can rent a car and drive there by yourself. 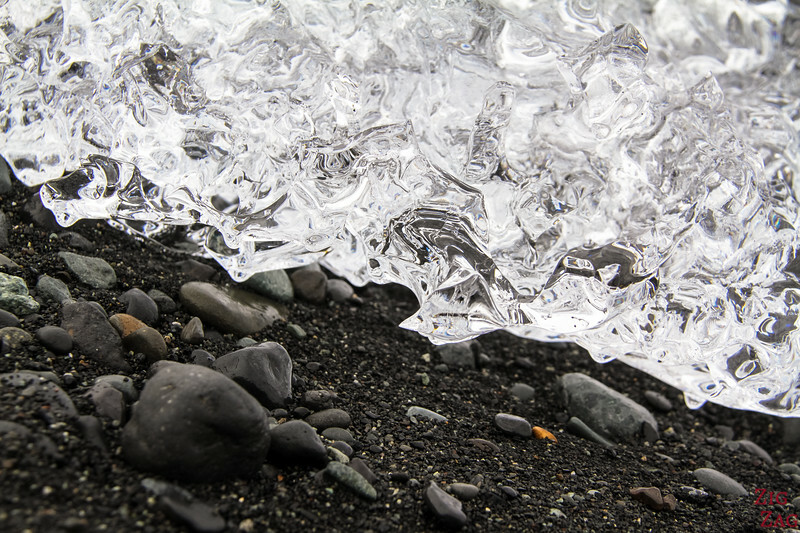 Diamond beach, along with many other beautiful places, is included in my eBook: The Road Trip Guide - Iceland. If you don't want to drive, join a day trip from Reykjavik, that will take your to the magnificent waterfalls of Seljalandsfoss and Skogafoss. 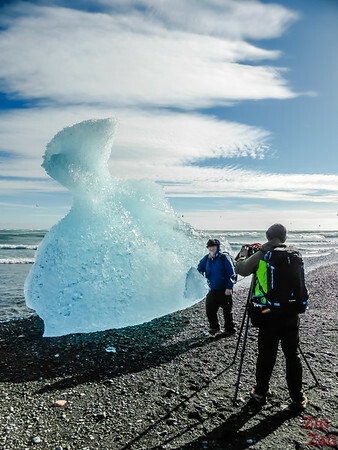 At Jokulsarlon, manage your time to walk to the Beach and see the icebergs. There is no best time of the year. 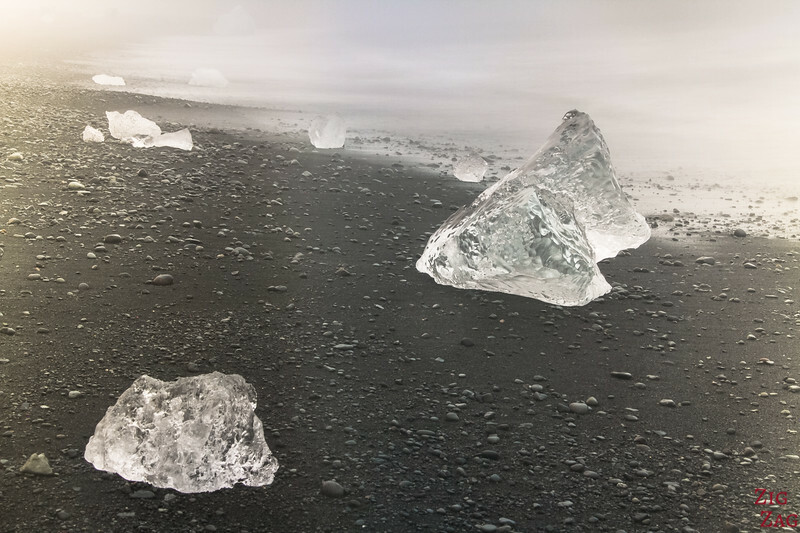 The Icebergs detach from the glacier all year long and the lagoon does not freeze so they escape and land on the black sand beach all the time. They do melt faster in Summer but we are not talking 40°C here... In September, I saw some huge ones! You never know how many icebergs you will find and how big they will be... This is a surprise! Sometimes they are small and sparse, sometimes they are everywhere and huge. It depends how much has separated from the glacier, and how the tide ans sea were when they made it to sea. 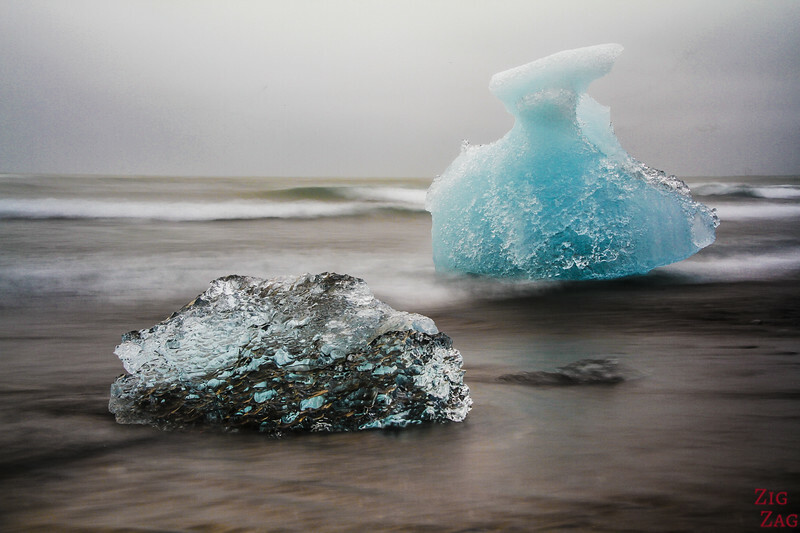 When the iceberg is under water, the air bubbles are washed away. When this ice is seen under the sun, the longer wavelength (red and yellow) are absorbed and blues and greens are reflected. I did not see one with a lot of black. The one being photographed below has a little. 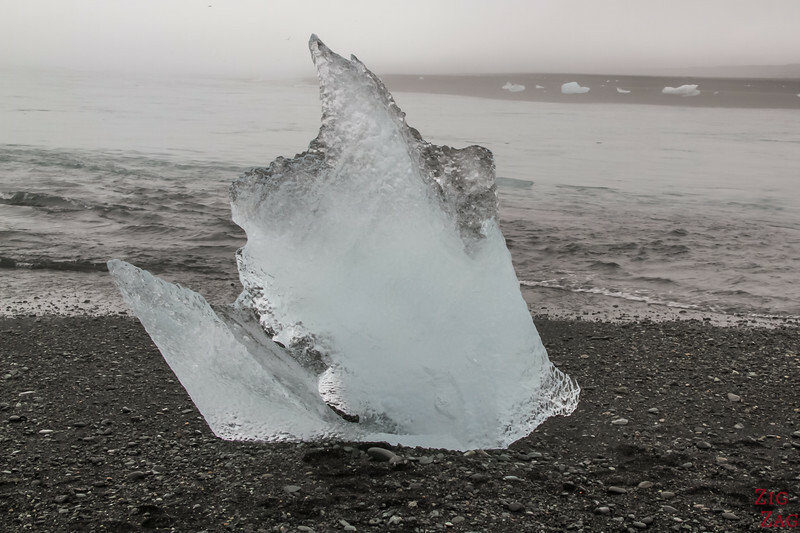 It is due to volcanic dust being trapped in the ice. 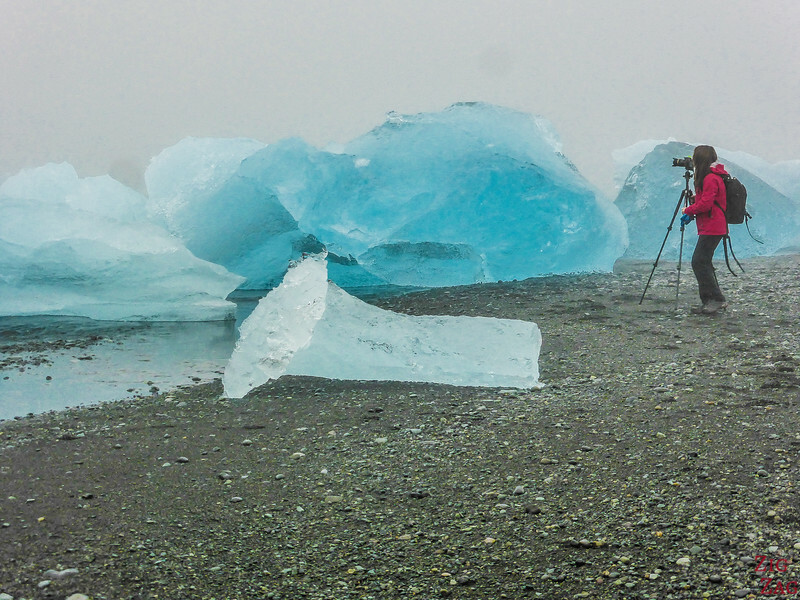 At Jokulsarlon beach you can get really close to the icebergs and even touch them! Sometimes there are so many on the beach, that you can be alone photographing one. Wait for the weather to change - you know the saying in Iceland: "if you don't like the weather, just wait 5minutes"
On the other side of the bridge, the main attraction is the Lagoon. 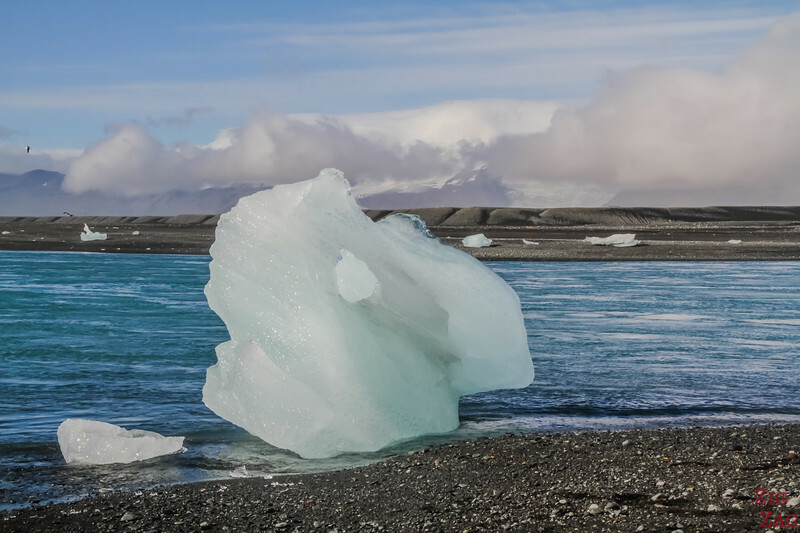 If the weather is clear you can see the glacier tongue of Breiðamerkursandur and you can see the icebergs floating by you. 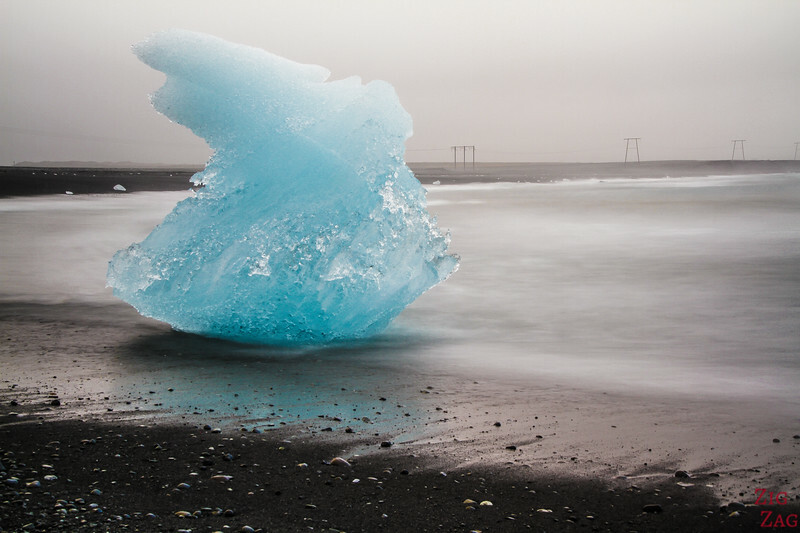 See photos on my article about the ﻿﻿Jokulsarlon Lagoon. 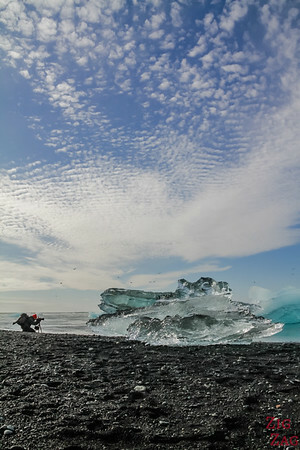 During Summer and the shoulder seasons, you can go on a boat to approach the icebergs and the glacier tongue closer. And maybe you will see one detach and splash in the water! 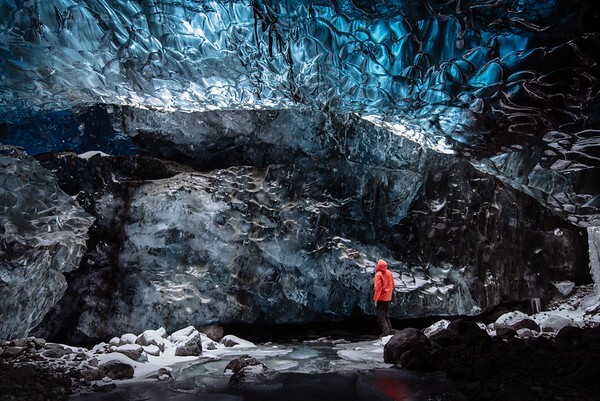 The Crystal Ice Cave is one of the most magnificent sights in Iceland. A really unique experience! 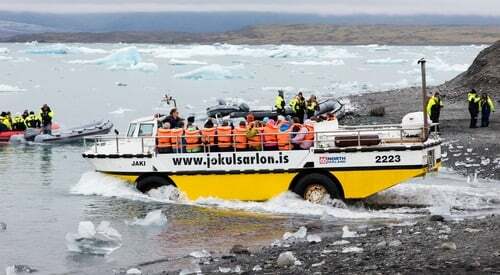 Access requires a 4WD - Small group tours depart from Jokulsarlon but spots are limited. Sometimes there is no ice at all. Go check out another place and come back later! If you want to stay closer: Hali Country Hotel and Skyrhusid Guesthouse are just 10min drive away. 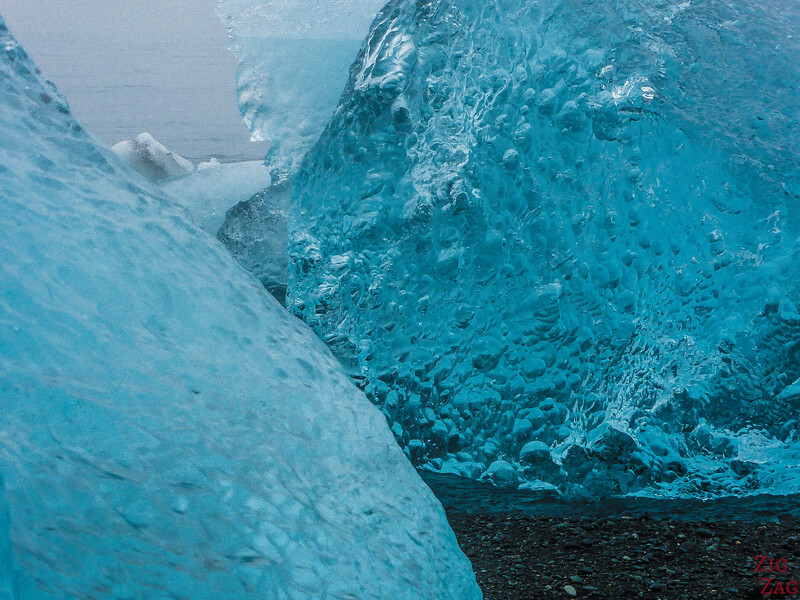 Have you ever been so close to icebergs? What a magical place! I really like your stunning photography and all the information in your post. It’s like going without leaving my chair. I really want to go now though 🙂 Thanks for sharing this awesome experience!